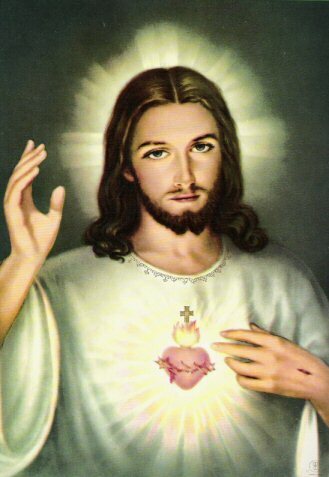 Today the Church celebrates the Solemnity of the Most Sacred Heart of Jesus. I find myself very curious to explore accounts of men and women throughout history who have experienced the Sacred Heart of Jesus. Saint Margaret Mary Alacoque, a French Visitation nun, had numerous visions of Jesus who revealed to her His Most Sacred Heart. This happened circa 1672. Since then, prayers and devotions seems to flourish and expand throughout the world. Jesus urged her to proclaim to the world the necessity of frequent Communion (as well as Communion on the First Friday of the month), and acts of reparation. One of St. Alacoque’s prayers that she was inspired to write (and my favorite) was an Act of Consecration to the Sacred Heart. I will share it with everyone and pray that you will take this prayer and commit to a life grounded in Jesus and His Most Sacred Heart. In loving, honoring and glorifying Thee. All that can displease Thee. At the hour of my death. Which I have so justly merited. I hope all from Thine infinite Goodness. All that can displease or resist Thee. Or be separated from Thee.